One of the most common residential stored product insects, this can also be more than a nuisance in some food plant and warehousing situations. Cosmopolitan in distribution, these insects may be found in nature and infest a structure from its surroundings, especially in the Corn Belt. All of the damage to food is produced by the larval stage as the adults lack mouthparts. Locating and disposing of the infested food source is the best method residentially. 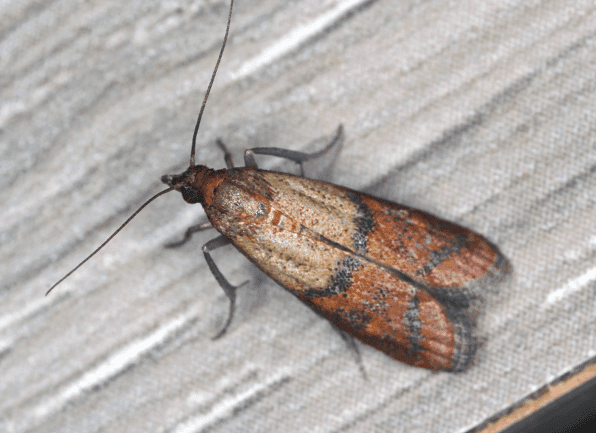 Indian meal moths respond well to pheromone monitoring programs in commercial environments and stress the importance of good warehousing and sanitation practices. A small moth with a 5/8” wingspan, the outer 1/3 of the wing is covered with copper to bronze colored scales, then a thin brown band leading to a pale tan inner ½ of wing. Larvae are ½” long, dirty white sometimes with pink or green tints. Larvae feed from a tunnel-like silken case covered in frass and debris. Feeding activity from larvae easy to spot as it consists of silken webbing on the top surface of the infested food source. Larvae will crawl away from the food source to pupate, usually going to high corners or ceilings to spin their small cocoon. Indian meal moths will feed on a wide variety of sources, ranging from dried pet food, bird seed, dried peppers, nuts and even dried flower arrangements in residential settings to whole wheat and corn meal in commercial locations. Locating and removing infested material plus any pupal casings from surrounding area best practice for residential settings. Pheromone trapping works well to track activity in commercial settings. Low dose pheromone traps can help pinpoint activity. Dye marking pheromone stations placed outdoors can be used to determine if exterior activity is entering a structure. Mating Disruption pheromone is an effective management strategy as it interferes with the limited adult lifespan and egg viability by inhibiting male moth’s ability to locate females. Mass trapping pheromone strategies can be effective but could also draw in insects from outdoors through poor placement and exclusion issues. ULV space fogging can be effective for eliminating exposed adults. Fumigation may be required for severe activity. What’s Gotten Into My Louisville Pantry?